What are you looking at? : "It Tastes Like Feet!" Today provided a sort of break-through moment for me, as the technical director I have inwardly referred to as The Man Who Hates My Guts Or At Least Doesn't Like Me Very Much made it a special point to invite me to the company's Christmas breakfast, a breakfast I had originally planned to skip because there would be things like French toast and omelets and I don't like French toast and omelets and I didn't want to appear snobby by participating in a breakfast at which I didn't plan to eat. However, I had been so sure that this man Hated My Guts Or At Least Didn't Like Me Very Much and was therefore so moved by this gesture that I could only smile, nod, and follow him to the breakroom, where he and another scientist were playing chef. I took in the scene: griddles with toast sticks, tubes of salsa, sheets of bacon, and frying pans for yucky, cheesy, surely-going-to-increase-my-cholesterol omelets. To my relief, though, there was also a healthy supply of muffins and bagels. Was there a chance I could survive this experience carbed up and unscathed? "So, what'll it be?" he asked. At that point a banana-nut muffin was already on my plate; yet, instinctively, I knew that wouldn't be enough to appease the emotional appetite of a man determined to feed me. So I did what many eager-to-pleasers have done before: play dumb to stall for time. "You know, I've never even had an omelet. What goes into one?" "Meat, mushrooms, cheese.... Whatever you want." "Aww! I'm supposed to cut down my cheese intake," I said apologetically, all the while mentally high-fiving myself for pulling out the health card, because really, who has the gall to challenge the health card? Surely not The Man? "We don't have to put cheese in it. We can cook it however you want. Really." By now it's decision time and I'm panicked. I don't understand! I like meat, mushrooms, and cheese. But I don't like omelets. Why don't I like omelets? Tell me, Jesus, why don't I like omelets? It wasn't until after I had agreed to my sentence that my eyes met his hand and my prayer was answered. I watched in horror as the eggs got eggier and the omelet got omeletier and pretty soon it was impossible to tell where one part ended and the other began. In mere minutes, The Man was presenting his finished masterpiece. "You wanna put salsa on that?" he asked. The hell? But there was no choice. In a desperate attempt to cancel out the substance's rubber plasticity, I drowned that mutha in Pace and never looked back. Once at the table, I took my time. Had a drink of cranberry juice. Enjoyed a slice of bacon. Picked at the meat that had worked its way out of its taco-like coccoon. Checked to see if The Man was looking. The Man was looking. And kept looking until a forkful of the stuff was in my mouth. "How do you like your first omelet?" he asked, and I was immediately reminded of that episode of Friends where Rachel makes the beef trifle. It took all my energy NOT to disguise my gag reflex with belly rubs, head nods, and encouraging mmmm sounds. Luckily, it only took one "It's good!" from me before he had to go back to work, and then my other colleagues were going back to work and I was on the path back to my cubicle, believing myself fortunate to escape the situation as intact as I did. 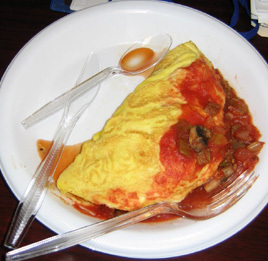 The omelet sat on my desk for approximately twelve minutes before I wrapped it up in a paper towel and stuffed it in the trash. One day, when The Man and I are bosom friends, I'll share this story and we'll enjoy a hearty laugh, just like how my former boss likes to bring up the time she found my doodle paper in the fax room, bearing scribbles that combined her first name with the last name of her last boyfriend. Just to see if it looked nice. Frema, you have such a way with words. "I watched in horror as the eggs got eggier and the omelet got omeletier and pretty soon it was impossible to tell where one part ended and the other began." You know, I often wonder how much of your hatred of so many common foods is more in your head and whether or not you really allow yourself to taste anything that goes into your mouth. I've seen you "try" a few different things now, and you typically just take a bite the size of a grain of sand, in which case you aren't really tasting anything and are only imagining that the substance tastes like you think it looks. That's what I think anyway. Thanks for that in-depth analysis of my psyche, Dr. Phil. Just so I'm reading this correctly. . . you turned down the cheese arguing health reasons, then took some bacon? I'm no food-ologist, but I'm kind of sure your doctor didn't tell you to "lay off the cheese" and "load up on bacon and other fried meats." So the Man is a technical director and makes omelets as well? How versatile! Luke, omelets are disgusting. They just are. Food needs TEXTURE. Did you not read that I threw the omelet away? The omelet that had the meat? The bacon and sausage-picking was just a cover to avoid the overall grossness of the omelet! The omelet that I didn't like because it was an omelet, not because it was bad for me. That part was just bonus. The tabloids say that Oprah is firing Dr. Phil. Did he catch you taking a picture of his omlettey masterpiece? I think often in couples, one person likes omelettes and the other doesn't. My husband likes them; I hate them. Maybe this is nature's way of ensuring that omelettes have a place in every home. Bearette I think you are right because I love them and my husband hates them. I can't believe you even took a frickin' bite! You are such a picky eater and for you to pretend to like the food you detest the most...well that just frosts my cookies in a good way. WAY TO GO BIG SIS!! I will not be afraid. What can anyone do to me?" "The best way out is always through." "Breathe, pray, be kind, stop grabbing." "Mere completion is a rather honorable achievement in its own right."